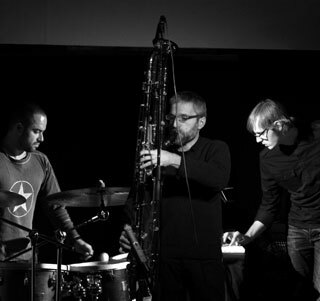 The trio PETROLIO takes shape in 2007 when the percussionist and sound designer Luca Robba, aka Mescalinaeden (UK) met in an experimental music festival in Italy the duo Mimesys formed by Michele Spanghero (Italy) on double bass and electronics and Ugo Boscain (France) on clarinets. PETROLIO is an improvised electro-acoustic music project that follows instant compositional structures, generated by the intense interaction between the musicians and the acoustic space of the performance towards minimal atmospheres and microtonal textures. The name of the band, PETROLIO (coal oil), represents perfectly the music that they create: a dark, gloomy, enigmatic and intriguing soundscape. The band works also via internet sharing music files and revising the raw music collected during their live performances and recording sessions. The reprocessed material is then used as source for new improvisations in a perpetual metamorphosis and evolution of their sound. End of Vision is their debut album for Gruenrekorder label. It’s a concept record dedicated to the unfinished novel by Pier Paolo Pasolini titled Petrolio. All the music was played live at the International School for Advanced Studies in Trieste (Italy) and has been recorded with omni-directional microphones to catch the ambience sound blending every instrument and the live electronic together. Only a few tracks have electronics overdubbing and post-production. Since 2008, PETROLIO toured a lot on north Italy; at present the band is recording new material and is planning to play in various European countries. Luca Robba is a former punk rock drummer who played with many popular musicians in UK and worked with a few acclaimed producers like Gordon Raphael (The Strokes) and Paul Noble (Magic Numbers). He started to compose his own experimental music in 2000 as Mescalinaeden and since then he decided to concentrate more on electronic music, releasing a few records and performing in various art festival in UK. At present Luca is playing with the Unknown Devices Orchestra of David Toop. Michele Spanghero is a sound and visual artist. His current interest is focused on improvised and electronic music (as double bass player and composer) and sound art installations. He’s conducting a parallel path of visual research on the photographic medium. He has exhibited and performed in different international contexts such as festivals, clubs, art galleries and museums in many European countries. He also works for three international contemporary art galleries: Artericambi (Italy), Galerie Mario Mazzoli and Factory-Art (Germany). Ugo Boscain is a multi-instrumentalist improviser. He’s trained on classical music piano and composition, but has always shown a considerable interest for improvisation in the widest sense, that he has developed in seminars with Mal Waldron and Steve Lacy. In mid Eighties he was the co-founder of Enten Eller jazz ensemble. In recent years he devoted himself mainly to contrabass clarinet becoming one of the very few specialists on that instrument.